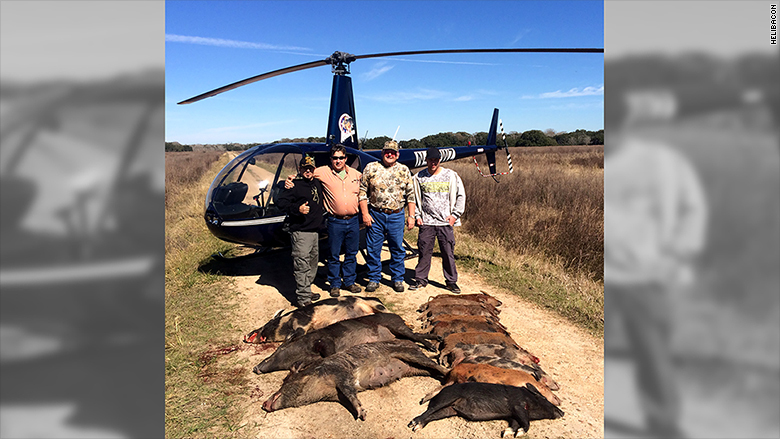 Companies like Helibacon, which charges customers thousands of dollars to shoot wild boars from helicopters, are capitalizing on pig proliferation in Texas. Ravenous wild boars run roughshod over Texas, but entrepreneurs have figured out how to turn the land-ravaging pigs into a money-making resource. Hunters, ranchers and farmers shoot the boars on sight, an attempt at mass eradication that's encouraged by state lawmakers, who recently legalized hunting them from hot air balloons. Why? Because it's quieter than hunting them from helicopters, as is often done. Spanish conquistadors introduced the boars to Texas in the 1500s as a ready food source. In the 20th century, more pigs were brought to game preserves. Since then, they've been breeding rapidly, at an annual rate of half a dozen piglets per sow. There are about 2.6 million wild boars in Texas and up to 9 million in the U.S., according to Billy Higginbotham, wildlife professor at Texas A&M. They cause $1.5 billion in damage yearly by rooting up crops and eating livestock, according to estimates. But there is also money to be made off these invasive species. The hog infestation has given rise to a variety of businesses capitalizing on wild boar, ranging from the helicopter tours that shoot them to the big city restaurants that serve them. "You've got all of these different entities that are literally taking a sow's ear and making a silk purse out of it," said Higginbotham. Companies like HeliBacon of Bryan, Texas, charge customers thousands of dollars to machine-gun hogs from helicopters, which is harder than it sounds, even with full auto AR-15s. "Your target is running, and it's not necessarily running in the same direction that the helicopter is flying," said HeliBacon managing partner Chris Britt. "Imagine riding in a roller coaster while you're trying to shoot something, and it's moving." Britt said he co-founded the company in 2012, a year after Texas passed its so-called pork chopper bill to help cull the wild pig population with the aid of helicopters. "This is not technically hunting; this is aerial depredation," said Britt. "I can shoot wild hogs and coyotes from an aircraft, but I can't shoot a deer, that would be illegal." He said they take well-heeled clients like hedge fund managers and other white collar workers on corporate retreats four or five times a week, killing thousands of hogs per year. "The feral hogs breed so much I don't know that we've made much of a dent in the actual population," he said. "There's so many of them, and they reproduce so fast. It's not a solution, it's just more of a population management approach." Killing hogs isn't easy. Ammunition brands like Freedom Munitions sell anti-hog AR-15 bullets like the Boar Buster, designed to punch through their armored hides and "gristle shields," according to Jansen Jones, president of the parent company Howell Munitions & Technology in Lewiston, Idaho. "Hogs are very tough animals; they've got tough thick bone," he said. "So you need a bullet that can stay together and penetrate thick hide and crush bone." Not everyone is thrilled with these methods of culling. "We're against any kind of aerial gunning as a way to manage a conflict with wild animals, especially when it's sort of farmed out like this," said John Griffin, director of urban wildlife for the Humane Society of the United States. "They do take a toll on the environment, but they should be handled more humanely. This is more of a spectacle than a responsible way of managing them." 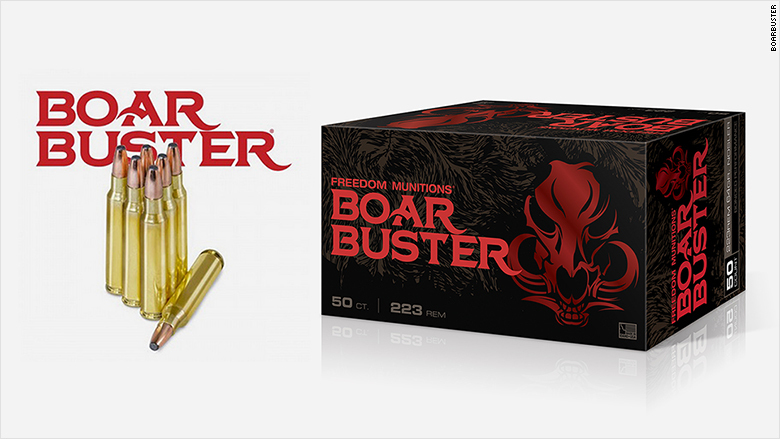 The Boar Buster is an ammo brand from Freedom Munitions that is marketed towards boar hunters. Hogs can also be trapped live. A company named BoarBuster, from Thomas, Oklahoma, sells mobile-controlled hog traps the size of studio apartments, with live streaming video. The cage, camera and shipping costs $6,000. Ranchers also use companies like Lone Star Trapping to capture and remove live hogs. Captured hogs are often sold to distributors, and then to butchers or game preserves. Most eventually end up on dinner tables in Texas BBQ joints as well as restaurants in California and New York. Wild boar is a traditional meat in Italy, where it's served in a ragu sauce with pappardelle pasta. So it's nothing new to New York foodies, who've been dining on it for decades in Italian restaurants like DeGrezia Ristorante in Manhattan. The overpopulation of wild boars in Texas ranch lands has prompted a new wave of culinary creativity. It's become a fixture of Texas cuisine, even though the tough meat is tricky to prepare. "Because the wild boars are wild and they eat a variety of different things you get different flavors in the meat," said Chef Tim Love, who barbecues boar ribs at his restaurant, Lonesome Dove Western Bistro in Austin, Texas. "That makes it exciting. If you do it right it's really delicious; if you don't do it right you're chewing for a week." Love said that he buys the boar meat from Texas distributors. He said he also shoots up to a dozen boars every time he visits his ranch, for purposes of eradication. Texas' law stipulates that hunters are allowed to eat the meat, but only state-approved trappers are allowed to sell it. They're like gigantic rats," Love said. "But at least they're edible." Lee Kim of Burattino Brick Oven Pizza uses peperonni made from Texas wild boars. Boar is turning up in more and more dishes - including pizza. 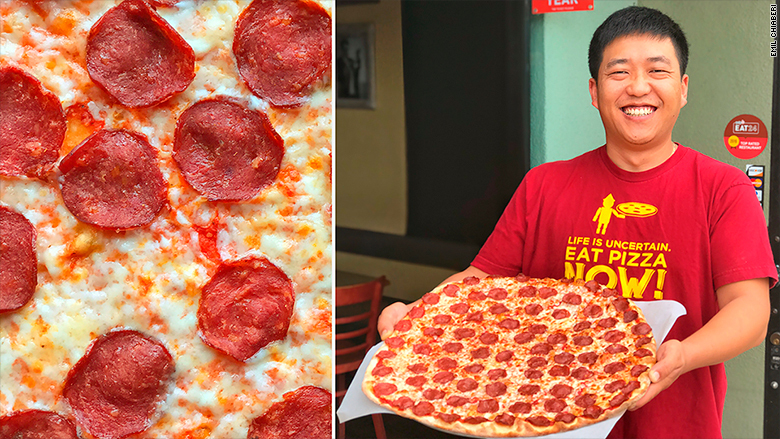 Lee Kim, co-owner of Burattino Brick Oven Pizza in Rancho Palos Verdes near Los Angeles, said he decided to "solve this wild boar overpopulation problem once and for all." He sources boar meat from Texas and has a meat processor make it into pepperoni. "It's so tasty," he said. "There's no grease and it is very lean. Try this, I tell you, and you will never go back to normal pepperoni."